We just returned from Bali, Indonesia, and the memories are still fresh in my mind. Bali is a land of hospitality and friendship. For the two weeks spent there, we were met with so much love and acceptance. After an exhausting travel time of 30 hours, we were able to unwind in our villa booked through Airbnb. Travel Tip: If you are traveling with a large group (we were a group of eight), we recommend renting a house for your stay. Not only are there affordable places all over the world, but having your own kitchen can save a lot of money. The view from our balcony at the Airbnb. Our first stop in Bali was North Kuta. Surrounded by rice paddies and farming villages, we were awakened by roosters every morning. 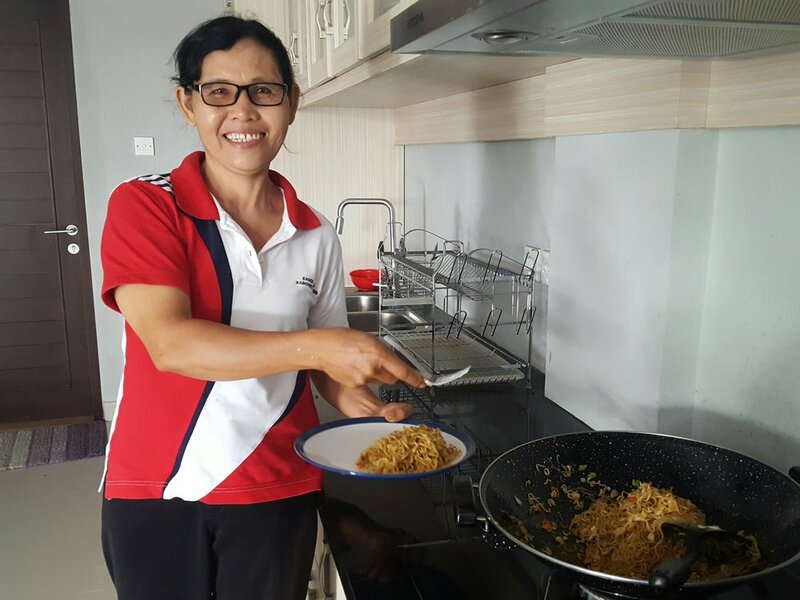 A wonderful surprise was that the Airbnb included a housekeeper who cooked authentic Balinese meals for us daily. Made (pronounced Ma-d`e) was such a blessing to be around. She quickly became our surrogate mother by the end of our stay in the villa. She even took the time to show me how to make a few traditional dishes! Bali in not a very large island, and you can quickly get around. Because it was around New Years during our stay, we frequented Kuta, which is known as a party town. If you like beach clubs, I highly recommend Finn's Club. They have pools and lounges overlooking the Indian Ocean, with a full service menu. With DJ's spinning all hours of the day, the club is still family friendly. Pura Tanah Lot is a world famous temple built on a rock formation in the ocean. Located by a large outdoor market, it is a sight to behold and a wonderful place to cool off. While in Bali, water sports are a must. 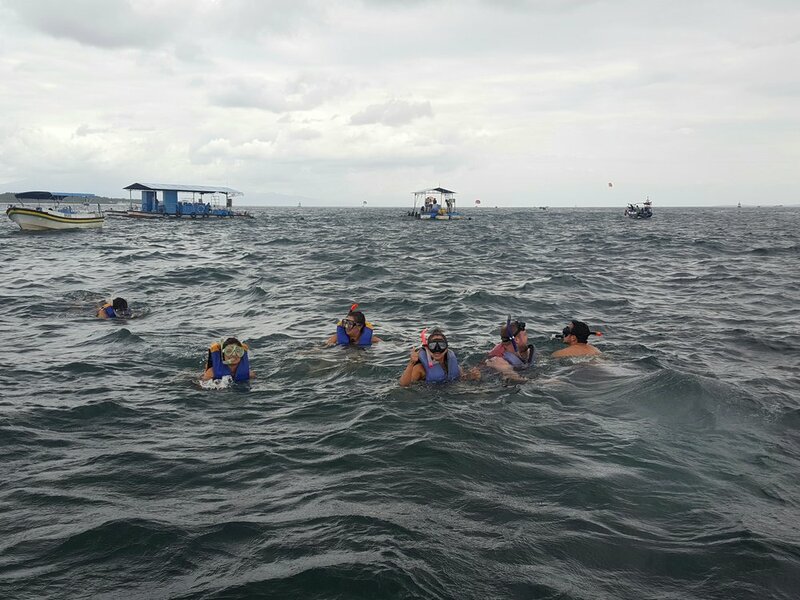 There are activities such as water walking, scuba diving, snorkeling and parasailing. Several beaches all over the island offer endless entertainment on a hot day. Buy fireworks on the side of the road! After our time in Kuta came to a close, it was time to venture off into Ubud, which is located in the central part of Bali. Ubud is known for its lush, green jungles. It has become even more popular-and crowded-in the last few years due to the book and film "Eat, Pray, Love." I fell in love the moment I stepped into Ubud. Temples and shrines are adorned with foliage. 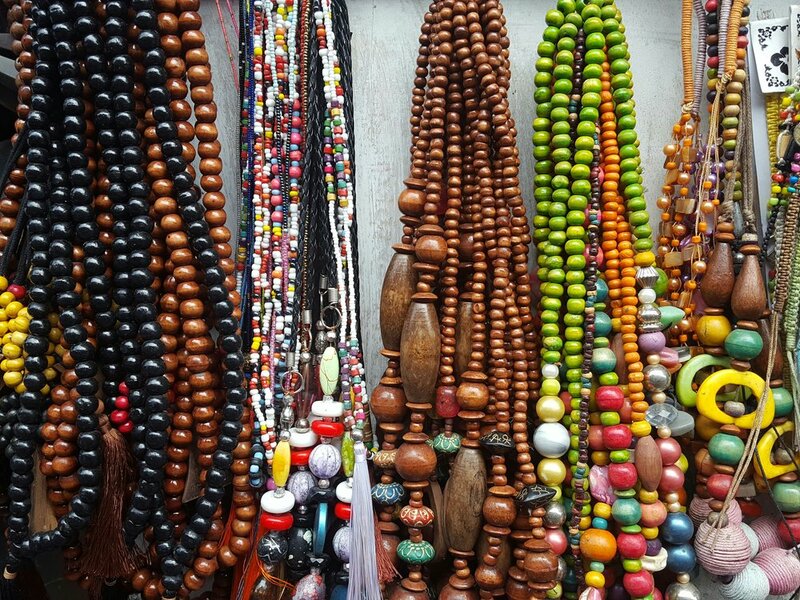 Quaint streets waft with delicious aromas as you are visually stimulated by the vibrant boutiques dotting every corner. There is also a large market where you are expected to haggle to at least 50% of the asking price. It was heaven on earth! While in Ubud, we stayed in a Balinese style hotel called Bumi Muwa. Tucked away behind a few shops, it was a secret garden among the hustle and bustle of the main street, and only a ten minute walk from the Sacred Monkey Forest. Sometimes a few hairy visitors could be heard swinging through the trees and landing on your patio. Rafting: White water rafting in Ubud is great for first timers, because the difficulty level is low. The view is also spectacular! You are dropped off at a rice paddy, where you have to descend 300 steps into the heart of the jungle, to the river below. It was all smooth sailing from there (not literally). Our tour guide was hilarious, and quickly put us at ease after a few splashes. Halfway through the tour, we were able to jump out of the raft and stand under a gushing waterfall. The tour lasts about three hours, but you will enjoy every minute of it (well, maybe not the 300 steps climbing back up to the top). My crazy group of Bali Buddies! Religion: The Balinese people hold religion dear to their heart. Temples and shrines are well kept and peaceful to explore. The majority of Balinese people are Hindu. Each family home (or compound) will have its own personal temple. 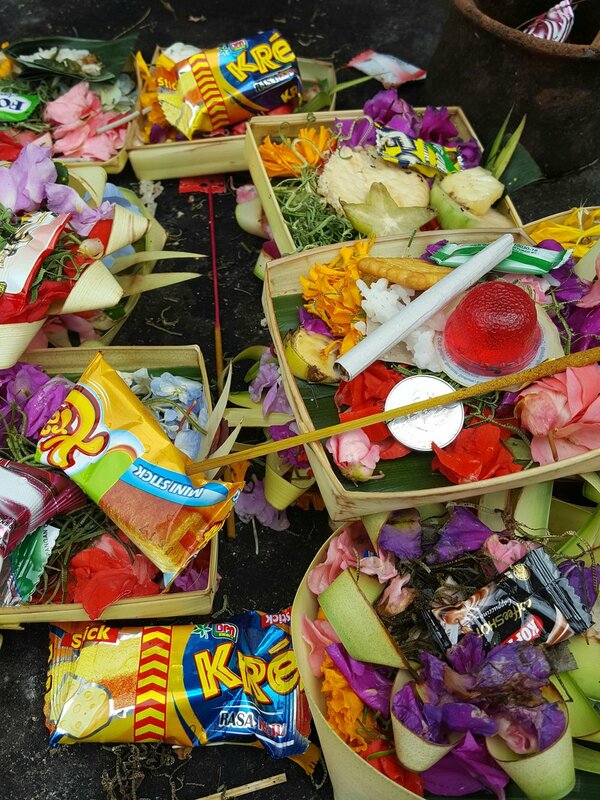 They pray almost every hour of the day, and they set out a prayer called a "canang sari" consisting of flowers, rice and leaves. The Balinese people believe in Karma and reincarnation. This is why they are so kind to others. Each individual is responsible for their own karma. Your fate depends on your own actions. This is why everything happens for a reason. Dance: If you have time, stop by a traditional Balinese dance. We were able to catch a performance of the "Barong and Rangda" dance, which paints the story of the eternal conflict of good and evil. The Balinese believe you have to embrace both sides. There cannot be good without bad and vice versa. Art: As in all cultures, one way to keep tradition alive is through art. The Balinese have an ancient art form where one paints each scene dot by dot, sometimes taking months to complete. We were fortunate to stop by the Wayan Gama Painting school which offered free classes to local youth to keep the art form alive. Kids from 6-7 all the way up to young adults were encouraged to paint their visions. I can't even begin to describe the amount of detail these kids put into their paintings. A young artist carefully adding the final touches. Culture: On our last full day in Bali, our wonderful guide Sang from The Authentic Bali invited us to his village to experience a traditional festival. He outfitted us in traditional garb and not only were we able to witness the festival, but be a part of the prayer and parade. Several villages in the district of Ubud gathered in Sang's hometown. He described it as a gathering for villagers to socialize with friends, family, or to possibly meet their soulmate from a neighboring village. Even the king of Ubud was there (yes, they have a king!). It was worth melting away in the hot sun to experience such a momentous event. As with all good things, our adventure had to come to a close. What I gained from this trip was learning to love and embrace others from all walks of life. We may have different views personally, politically and religiously, but we can still greet others with kindness and a smile.